For four years, while my daughter Sarah was a student at Missouri State University, my family made relatively frequent trips up and down Interstate 44 from St. Louis to Springfield, Mo. In the last few trips, I noticed a new designation along the road, which, of course, always made me think about Babe. I was reminded about the picture now that we’ve gotten to Babe’s letters in which he describes being wounded and subsequently receiving his Purple Heart. I have Babe’s medals and the flag that was draped over his coffin in a case in my living room (a case built by hand, by the way, by a great friend of my father’s, Bill Lowe — an accomplished carpenter). I knew the Purple Heart — with history tracing back to the “Badge of Merit” created in August 1782 by George Washington — was awarded to service men and women who were wounded or killed during their service. The distinction is that they must be “killed or wounded in action by weapon fire while directly engaged in armed conflict, other than as the result of an act of an enemy of the United States” (emphasis mine). Clearly, Babe met the criteria when he was wounded sometime in November 1944, although he protests that the wound was minor (“I have been slightly wounded in the right fifth toe…”). The circumstances of his injury are unknown to me. Unless he says something clear in a later letter that I’ve forgotten about, I know nothing about how he was injured. A letter dated Oct. 8, 1946, from the army to my grandmother, details where Babe saw action with his unit, where he was assigned during his enlisted time and the fact that “he was awarded the Good Conduct and the Purple Heart Medals.” But I have no official documentation that details how he was wounded. We established earlier from a conversation and from official records that Babe’s death was not combat related in any way, and that it may have just been the result of some joy-riding after the German surrender in Italy. Hence, no second Purple Heart. In related news, I discovered while researching this that there is a National Purple Heart Hall of Honor located in New Windsor, N.Y. The site includes a searchable database of people who have received the Purple Heart, but it is only as complete as the records the curators can collect, or that have been submitted by recipients. It appears I do not have the records they require to submit Babe’s receipt of the medal; they were likely destroyed in the 1973 fire at the National Personnel Records Center in the St. Louis area. The hall of honor’s online database lists four Mauros who received the Purple Heart. 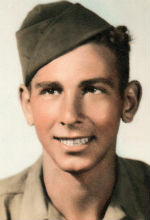 One of them, Dominic, received two in World War II (one of them within months of Babe’s injury). Another, James, received his in World War I. The other two — Robert and Chester — do not include any details about when they were awarded.